An efficient protocol for the ex vivo expansion of tumor-reactive T cells from tumor-draining lymph nodes or other secondary lymphoid tissues of tumor-bearing hosts is described. This protocol selectively expands tumor-specific T cells for use in adoptive immunotherapy of breast cancer. Kmieciak, M., Toor, A., Graham, L., Bear, H. D., Manjili, M. H. Ex vivo Expansion of Tumor-reactive T Cells by Means of Bryostatin 1/Ionomycin and the Common Gamma Chain Cytokines Formulation. J. Vis. Exp. (47), e2381, doi:10.3791/2381 (2011). It was reported that breast cancer patients have pre-existing immune responses against their tumors1,2. However, such immune responses fail to provide complete protection against the development or recurrence of breast cancer. To overcome this problem by increasing the frequency of tumor-reactive T cells, adoptive immunotherapy has been employed. A variety of protocols have been used for the expansion of tumor-specific T cells. These protocols, however, are restricted to the use of tumor antigens ex vivo for the activation of antigen-specific T cells. Very recently, common gamma chain cytokines such as IL-2, IL-7, IL-15, and IL-21 have been used alone or in combination for the enhancement of anti-tumor immune responses3. However, it is not clear what formulation would work best for the expansion of tumor-reactive T cells. Here we present a protocol for the selective activation and expansion of tumor-reactive T cells from the FVBN202 transgenic mouse model of HER-2/neu positive breast carcinoma for use in adoptive T cell therapy of breast cancer. The protocol includes activation of T cells with bryostatin-1/ionomycin (B/I) and IL-2 in the absence of tumor antigens for 16 hours. B/I activation mimics intracellular signals that result in T cell activation by increasing protein kinase C activity and intracellular calcium, respectively4. This protocol specifically activates tumor-specific T cells while killing irrelevant T cells. The B/I-activated T cells are cultured with IL-7 and IL-15 for 24 hours and then pulsed with IL-2. After 24 hours, T cells are washed, split, and cultured with IL-7 + IL-15 for additional 4 days. Tumor-specificity and anti-tumor efficacy of the ex vivo expanded T cells is determined. Isolate tumor-draining lymph nodes or spleens from tumor-bearing FVBN202 transgenic mice and prepare single cell suspension in ice-cold RPMI1640 supplemented with 10% FBS. B/I activation in 50-ml polypropylene conical tubes results in a greater T cell yield compared to polystyrene tubes. Ketamine and Xylazine are injected i.p. for anesthesia. Cervical dislocation is used as a method of euthanasia. Culture the cells (106 cells/ mL) in complete medium containing 15% FBS with bryostatin-1 (5 nM) and ionomycin (1 μM) along with 80 U/ mL of IL-2 (Peprotech) for 16 h.
Wash the cells three times with warm medium (37°C) and culture at 106 cells/ mL in complete medium with IL-7 (10 ng/ mL) and IL-15 (10 ng/ mL) (Peprotech) for 24 h.
Pulse the cells with IL-2 (40 U/ mL) for 24 h.
Split the cells and culture them with IL-7 and IL-15 (10 ng/ mL) for 4 more days. Change medium and split the cells if needed every 2 days. Count 9 squares and determine total cell number by dividing cell counts to the number of chambers multiplied by the dilution factor. The results will present number x 104 cells/ mL. Block non-specific binding of antibodies to Fc receptors by culturing the cells with anti-CD16/CD32 antibody (Biolegend) for 20 min on ice and then wash the cells two times with 2 mL of ice-cold PBS supplemented with 1% sodium azide. Stain the cells by culturing with FITC-CD4 and PE-CD8 antibodies for 20 min on ice and then wash the cells two times with 2 mL of ice-cold PBS supplemented with 1% FBS and 0.1% sodium azide. Fix the cells with 1% paraformaldehyde and run samples on a Beckman Coulter FC 500 and analyze using Summit version 4.3 software. Incubate T cells with tumor cells in a 10:1 effector:target ratios for 48 hours in complete medium at 3 mL complete medium (RPMI-1640 supplemented with 100U/ mL of penicillin, 100μg/ mL streptomycin, 10% FBS, glutamine and β- mercaptoethanol) and 20U/ mL of IL-2 (Peprotech) in 6 well culture dishes 37°C /5% CO2. FVBN202 transgenic female mice (Charles River Laboratories) can be used for the source of tumor-reactive T cells. These mice overexpress an unactivated rat neu transgene under the regulation of MMTV promoter and as a result develop spontaneous mammary carcinoma between 4-10 months of age7. These mice develop premalignant mammary hyperplasia similar to ductal carcinoma in situ (DCIS) prior to the development of spontaneous carcinoma8. Spontaneous tumor-bearing mice are used as donors of T cells. Activation of T cells with B/I for 16 hours results in killing of naíve T cells that are not sensitized with the tumor in vivo. 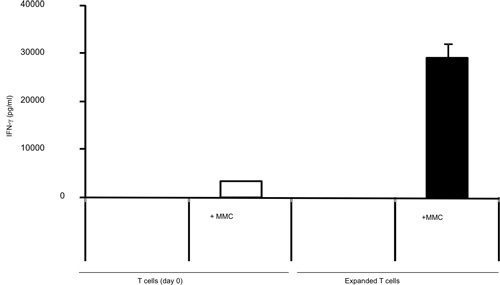 After the B/I selectivity of tumor-reactive T cells they expand up to 2.8-fold within a 6-day culture with the gamma chain cytokines (Figure 1). Both CD8+ and CD4+ T cells are equally expanded with the gamma chain cytokines (Figure 2). The ex vivo-expanded T cells show high responsiveness against the tumors that donor mice were sensitized to, as evaluated by the production of IFN-γ in the presence of neu positive mouse mammary carcinoma (MMC) tumor cells (Figure 3). The ex vivo expanded T cells can induce apoptosis in the neu positive MMC tumor cells such that viability of the tumor cells drops from 92% to 61% within 48 hours (Figure 4). Figure 2. Total percentage of CD4+ and CD8+ T cells before and after a 7-day expansion with the gamma chain cytokines. Selective expansion of tumor-reactive T cells with effector anti- tumor function can be achieved by the proposed protocol using B/I activation and ex vivo expansion with the gamma chain cytokines IL-2, IL-7 and IL-15. While IL-2 is a T cell growth factor that can support the differentiation and expansion of antigen-specific T cells, IL-7 can inhibit apoptosis of T cells and support their viability during expansion. IL-15 can support memory T cells that are important for generating long-term anti-tumor responses upon adoptive T cell therapy9-11. Changing the order and combination of these cytokines could affect differentiation of the expanded T cells which in turn may improve or reduce their anti-tumor efficacy12. The proposed protocol will not require the identification of tumor antigens. Selective expansion of tumor-reactive T cells results in the production of high numbers of anti-tumor T cells that can be used for adoptive T cell therapy of cancer patients. We have previously shown that the ex vivo expanded T cells protected animals against breast cancer following adoptive T cell therapy. This work was supported by NIH R01 CA104757 Grant (M. H. Manjili). We gratefully acknowledge the support of VCU Massey Cancer Center and the Commonwealth Foundation for Cancer Research. Goodell, V., Waisman, J., Salazar, L. G., de la Rosa, C., Link, J., Coveler, A. L., Childs, J. S., Fintak, P. A., Higgins, D. M., Disis, M. L. Level of HER-2/neu protein expression in breast cancer may affect the development of endogenous HER-2/neu-specific immunity. Mol Cancer Ther. 7, 449-454 (2008). Disis, M. L., Knutson, K. L., Schiffman, K., Rinn, K., McNeel, D. G. Pre-existent immunity to the HER-2/neu oncogenic protein in patients with HER-2/neu overexpressing breast and ovarian cancer. Breast Cancer Res Treat. 62, 245-252 (2000). Liu, S., Riley, J., Rosenberg, S., Parkhurst, M. Comparison of common gamma-chain cytokines, interleukin-2, interleukin-7, and interleukin-15 for the in vitro generation of human tumor-reactive T lymphocytes for adoptive cell transfer therapy. J. Immunother. 29, 284-293 (2006). Bear, H. D., Roberts, J., Cornell, D., Tombes, M. B., Kyle, B. Adoptive immunotherapy of cancer with pharmacologically activated lymph node lymphocytes: a pilot clinical trial. Cancer Immunol Immunother. 5, 269-274 (2001). Morales, J. K., Kmieciak, M., Graham, L., Feldmesser, M., Bear, H. D., Manjili, M. H. Adoptive transfer of HER2/neu-specific T cells expanded with alternating gamma chain cytokines mediate tumor regression when combined with the depletion of myeloid-derived suppressor cells. Cancer Immunol Immunother. 58, 941-953 (2009). Cha, E., Graham, L., Manjili, M. H., Bear, H. D., Guy, C. T., Webster, M. A., Schaller, M., Parsons, T. J., Cardiff, R. D. IL-7 + IL-15 are superior to IL-2 for the ex vivo expansion of 4T1 mammary carcinoma-specific T cells with greater efficacy against tumors in vivo. Breast Cancer Res Treat. 89, 10578-10582 (2009). Kmieciak, M., Morales, J. K., Morales, J., Bolesta, E., Grimes, M., Manjili, M. H. Danger signals and nonself entity of tumor antigen are both required for eliciting effective immune responses against HER-2/neu positive mammary carcinoma: implications for vaccine design. Cancer Immunol Immunother. 57, 1391-1398 (2008). Stern, J. B., Smith, K. A. Interleukin-2 induction of T-cell G1 progression and c-myb expression. Science. 233, 203-206 (1986). Kittipatarin, C., Khaled, A. R. ex vivo expansion of memory CD8 T cells from lymph nodes or spleen through in vitro culture with interleukin-7. J Immunol Methods. 344, 45-57 (2009). Kokaji, A. I., Hockley, D. L., Kane, K. P. IL-15 transpresentation augments CD8+ T cell activation and is required for optimal recall responses by central memory CD8+ T cells. J Immunol. 180, 4391-4401 (2008). 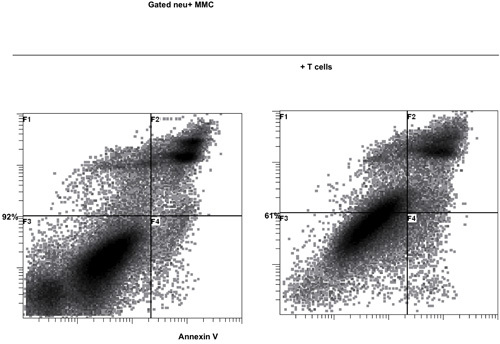 Le, H. K., Graham, L., Miller, C. H., Kmieciak, M., Manjili, M. H., Bear, H. D. Incubation of antigen-sensitized T lymphocytes activated with bryostatin 1 + ionomycin in IL-7 + IL-15 increases yield of cells capable of inducing regression of melanoma metastases compared to culture in IL-2. Cancer Immunol Immunother. 58, 1565-1576 (2009).